If you are in your 30’s, 40’s, or beyond, you can probably recall the days when metal fillings were the only options for treating dental cavities. 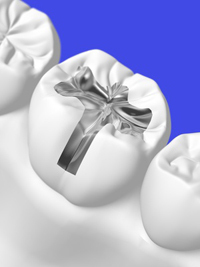 In prior decades, it was standard practice to fill cavities in teeth with silver (amalgam) fillings – fillings which often also contained mercury, an elemental chemical that, at certain levels, can be toxic to humans. This is why today’s dental professionals are opting not to use metal amalgams on patients, and are even recommending that patients who have metal dental fillings have them removed and replaced with newer filling materials. Metal fillings are composed of about half silver, tin, and/or copper, and about half mercury. Not only are metal fillings prone to degradation over time, especially in patients who grind or clench their teeth at night or chew their food aggressively, but the potential toxicity of the mercury remains in dispute. Mercury is both an elemental chemical listed on the periodic chart and a potent neurotoxin. When mercury content in air (vapor) reaches a certain level, it can cause mental and mood issues, autoimmune disease, neurological (nerve) damage, and chronic illness (such as Chronic Fatigue Syndrome). While the mercury vapor content present in metal fillings is very mild when compared with the official limits as set by OSHA (the Occupational Safety and Health Administration), different patients may have different tolerances to mercury. As well, while a single filling may not present much concern, for patients who have multiple metal amalgams, the risk factor of toxic exposure increases. If you have metal fillings, the best course of action is to talk with your dentist about whether or not to replace those fillings. If your metal fillings have begun to degrade or crack, this can present a great opportunity to remove the metal and refill your cavity with one of the new durable composite resins. While research is still inconclusive, it is known that toxic mercury vapor is released by metal fillings. That’s why it is perhaps wiser to opt for replacement over taking any chances of exposure to a known neurotoxin.